Not so dissimilar to any transit system or piece of machinery, urban ropeways require regular upkeep to ensure that operations remain trouble-free. A cable transport line’s maintenance regime will depend on a number of factors which include items related to technology choice, equipment, regulations/codes, number of operating hours and much more. To put it into perspective, readers can think of a ropeway like a car — there are standard service intervals. Daily, weekly, monthly and yearly maintenance procedures related to the inspection of grips, cabins, towers and stations are all typically timed and conducted during low passenger traffic periods to reduce impact on travellers. This year, starting on June 23, the Portland Aerial Tram, will undergo track rope maintenance where the system will be closed for five weeks. The YouTube video provides a great overview of the servicing and maintenance program that’s been planned for the aerial tram. The scheduled maintenance session will help ensure that the system can continue to transport 10,000 passengers per day and operate with a reliability level of 99.98%! The Portland Aerial Tram. Decided to turn this photo into a work of art. Loving the reflections cast on the building. Portland Aerial Tram. Image by Flickr user Dougtone. 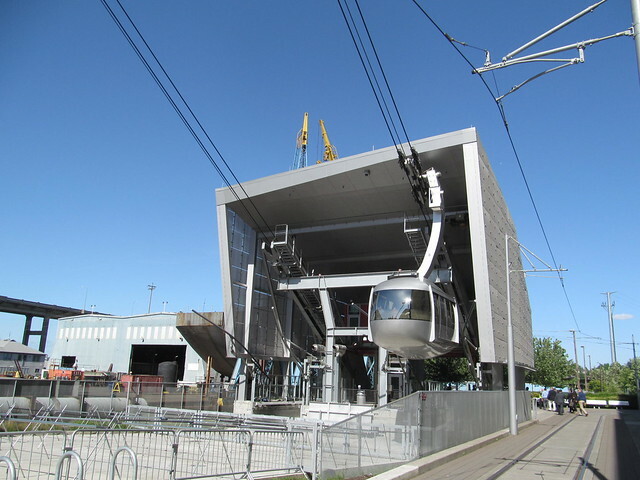 The Portland Aerial Tram is one of the best-designed CPT systems in the world. Its shiny, metallic, pill-shaped cabins float gracefully across the Rose City skyline, transporting medical staff, patients and sightseers from the South Waterfront district to the Oregon Health and Sciences University (OHSU) atop Marquam Hill. The 1km aerial journey takes less than 4 minutes, saving commuters from the hassle and inconvenience of a circuitous bus route. OHSU personnel and transit pass holders ride free but a round-trip ticket for sightseers seeking sky-high views is a very affordable $4.35. Its jigback cable system has won many design awards, but also caused more than its fair share of controversies, including signficant “scope creep”, privacy issues and, interestingly, aesthetics. (Such is the reality of urban design. One person’s “award-winning vision” is another’s “ugly”.) These days, those initial challenges are largely forgotten and residents beneath the CPT co-exist peacefully with it. In fact, many home sellers tout their property’s “prime location next to an aerial transit line”. The lower Tram station is a great example of a multi-modal transit hub, with great access to streetcars, buses and bike racks. This precedent-setting level of integration has contributed to its success and more than ~1.4 million passengers ride the system each year. Is Public Transportation 340% More Expensive Than It Needs To Be? Where do you put the towers? On this blog there’s a lot of talk about cable as a flexible and adaptable technology for urban transit. CPT can travel above roads and traffic, go through buildings, and cross rivers and gorges. But for all that to work there needs to be space for towers and stations, too. So what happens when a city’s simply got no space? Take New York City, for example. 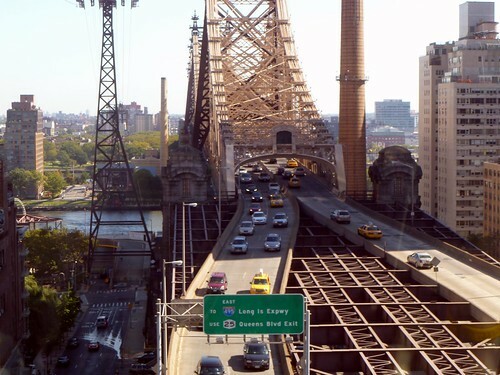 The Roosevelt Island Tram’s been dealing with this problem for 35 years by building a tower right over a road. Of course they did, because the system has three towers, two of which are located in Manhattan, the most densely populated New York City borough and the country’s densest county. The Roosevelt Tram tower sits right on top of 60th St. -- CC image by Flickr user David Berkowitz. Then there’s a system in Romania, where the city of Piatra Neamt built a cable car system, of which an entire kilometer traverses the city — towers and all. To do this they built a tower in a road median . . .
. . . one over a parking lot . . .
. . . and even one on top of a sidewalk, so as not to obstruct pedestrian traffic underneath. Now, we’re not saying this is the best way to go about designing towers. Remember, there are practical designs and then there are pretty designs. London and Portland have the aesthetics down pat. Both cities dedicated a lot of thought and effort (not to mention a few dollars) to create stunning architectural towers, and in return have (or will soon have) practical works of art, so to speak. But the adaptability seen in New York and Piatra Neamt should not go unnoticed either. As drab and industrial as the tower designs are, they represent a collaboration that can exist between municipalities and transit planning when both parties add a bit of imagination and ingenuity to the mix. The important question here is how to blend the practicality of New York and Piatra Neamt with the beauty of London and Portland. That’s the challenge and the opportunity. Sample White Card by CUP Projects. The series kicks off with cards on Major CPT Systems. Each card provides basic information on the system (with images and stats), our brief analysis of the installation, and other related Gondola Project posts and pages. The first two WHITE CARDS are now available online. You can find them on the WHITE CARDS Page or in the drop down menu, under “Learn About Cable” in the header. You do not make money from the distribution and sharing of the White Cards. You do not change anything in the White Cards. You do not “cut-and-paste” from the White Cards. Otherwise, feel free to share them in whatever form you like. Enjoy!